Panasonic will showcase its newly launched camera technology equipped with people masking technology, secure communications, smart coding and rain wash coating, as well as VIQS and facial recognition that the company says means a lower overall cost of ownership. “The theme for Panasonic at IFSEC 2016 is ‘Leading the way in intelligent security’. At the show we will introduce value propositions specific to banking, city surveillance, transport and museums and demonstrate why these unique embedded technologies ultimately produce not only more reliable security footage, but do so in the most cost-effective way possible,” said Gerard Figols, European Head of Product Marketing at Panasonic Security. Panasonic’s smart coding technology saves costs by reducing bandwidth and storage requirements by as much as 70 percent, while the rain wash coating which virtually eliminates the need for maintenance and cleaning of the camera lens. “Unless maintenance and network costs are taken in to account at the point of procurement, the client simply isn’t getting the full picture of the costs associated with owning and operating large scale CCTV systems,” added Gerard Figols. 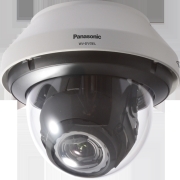 Also on show at the Panasonic booth, is the Aero-PTZ (WV-SUD638), the industry’s most robust PTZ security camera, designed for the most severe weather conditions and mission critical applications. For example, the camera has a lightweight fiberglass body which enables it to be resistant to effects from direct exposure to conditions such as salty air, present on piers, docks and harbours. Equipped with Full HD resolution at 60fps the Aero-PTZ has 30x optical zoom lens and features hybrid image stabilisation technology and gyro-sensors, to minimise the impact of external vibrations.. In addition, Panasonic will launch multi door video intercom systems to the European market for the first time. 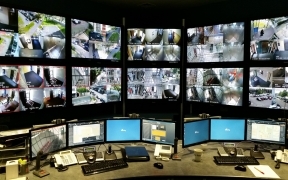 A combination of PBX and cameras can connect up to 18 lobby stations and 560 monitors for large apartment buildings. An IP version, capable of supporting up to 2,000 devices is set for release in early 2017..
Also on stand is a prototype ‘drone finder’ which is being developing to help mitigate the threat of drone accidents and terrorism. Using 32 array microphones and a Pan Tilt Zoom CCTV camera, each sensor can detect a drone at distances of up to 300m through a 150⁰ field of view..